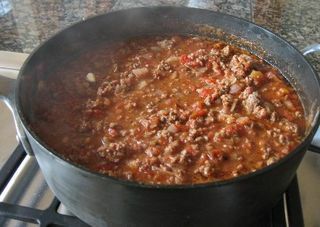 This is said to be the original recipe for the chili served at the highly popular Bob Pool’s Chili Joint in Dallas, Texas. Pool’s closed in the mid-1950s. This recipe makes 4 Texas-sized servings. In a heavy medium-sized pot, brown the meat in a small amount of vegetable shortening over high heat. Drain off excess shortening. Add beef broth, chicken broth, tomato sauce, prunes, and spice mixture #1. Bring to a boil, lower heat, cover the pot, and cook approximately 2 hours. Remove prunes and add water if necessary. Cook mixture longer if meat is not yet tender. Thirty minutes before turn-in (or before serving), add spice mixture #2 and cook over low heat. Fifteen minutes before turn-in (or before serving), add spice mixture #3 and continue cooking over low heat. Salt the chili to taste and serve hot.